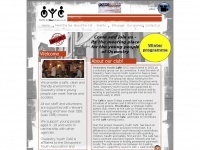 A total of 7 reviews for Ozyouthcafe.co.uk have been written yet. The most recent reviews are listed below. Just to repeat what a few others have said.. i ordered a pair of adidas rivea at what i (foolishly) considered a bargain price. I was sent a pair of ridiculous looking fake nike. I just emailed them before holidays so not sure what they emailed back but judging by previous comments im not holding out any hope!! Avoid!!!! Order completely wrong & fake. No way of contacting them. Luckily bank will refund & take action. I ignored the warning signs - slick website but completely different URL. Prices unbelievably low. And most embarrassing of all a text from my bank double checking if I really wanted to pay. Having gone ahead the regret was all mine. I ordered 3 pairs of Adidas Gazelles for £130. I received 2 pairs of different (and very ugly) trainers and a baseball cap. I contacted them to arrange returning them and get what I ordered. They said I must keep them have they will give a partial refund of £25. When I complained they stop replying and have received no refund at all. I am left with what are suspiciously lightweight shoes (ie fake?) in sizes that don't fit me and styles I wouldn't wear anyway. Learn from my foolishness. Ι ordered a pair of Womens Stan Smith 50 days ago and I still didn't received them. the communication with the site is zero. they send me the tracking number and since then nothing. No answers. I asked several times what happens with my order and no answer is comming from them. I'm afraid i lost my money with them. Beware and dont buy from this site. P.S. if and when i receive my order i will come back with my comments. beware this site advertise their price in UK pound currency but once you purchased your card will be charged in Chinese Yuan. Customer service is slow to answer and gave wrong information. They also chose not answer my question when I asked where their site is based and why my card was charge in chinese yuan. I've received my order today from this site and guess what it's wrong item. I ordered stan smith halo blue and they sent me adidas superstar. The alarming part is it is fake! the item is so obviously fake! I compared it with my old superstar and you will see the big difference. This site is based in China and manufactures replica of different shoes. Also the site seem to tell people they are UK site and the prices advertised are in UK pound but once you buy you will see in your card you have been charged in Chinese Yuan. Another thing is the package came from China!